Europa Mortgages are pleased to present a unique investment opportunity at the most exciting and innovative development currently available in Spain. The Village at Valle Romano is currently being marketed through a number of top English and Scottish football clubs. With unrivalled sports and leisure facilities, The Village at Valle Romano is set to become a top destination for holidaymakers in Southern Spain. For short term investors there is the prospect of a quick return on investment during the build phases. For those taking a longer view, the rental returns are expected to comfortably cover mortgage costs, and contribute to a long term investment producing both capital growth and rental income. 1. Fantastic payment terms – just 20% deposit to secure apartment and nothing more to pay until completion in early 2009, when interest only mortgages of 80% will be available through Europa Mortgages. 2. Prices starting at just 215,000 euros for a 2-bed ground floor apartment, up to 430,000 euros for the best Penthouses. 3. Top quality furniture package (see images) included in the price. With the management scheme your apartment will always be in a1 condition. 4. The normal 7% IVA is payable on completion, but will be reclaimable due to the planning status of these apartments. They are tourist apartments, and not for full time residential use. 5. The units will be fully managed as part of a Five-star hotel complex, and will have a rental guarantee in the first 3 years. 6. Large potential capital growth on your deposit before completion. For example, if you have paid 20% of a 215,000 euro apartment, ie 43,000 euros, and the apartment has increased to 255,000 euros in value, then your initial investment will have almost doubled in just two years. 7. All units are ‘frontline golf’ and the entrance to the development is just across from the beach. Estepona town and port are minutes away. Valle Romano Golf & Resort is not just another residential estate. 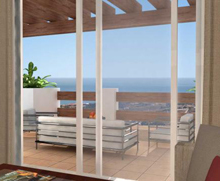 It is a luxury, high quality urban development in a privileged location, lying between the sea and the mountains. In this unique enclave, as attractive for it’s location as it is for it’s range of services and easy access, you’ll find 150 hectares where luxury properties share the space with a stunning 18-hole golf course, an exclusive 5 Star hotel, a state of the art spa and gymnasium, extensive swimming, football and tennis facilities, a commercial centre with bars, restaurants and shops; gated security and concierge facilities plus onsite property and rental management company. The Village is in an exclusive area of development, which will contain 1100 state of the art fully furnished apartments. All the apartments face directly onto the championship golf course with views of the sea and mountains behind. The beach is also less that half a mile away. All apartments are fully furnished with a choice of styles and colour schemes. They range in size from 63m2 – 72m2 built with additional terraces of 25m2 – 125m2. • With more than 300 days of sun every year and numerous golf courses Spain offers all year rental possibilities. • Although more expensive than some emerging countries, Spain has a long track record as a destination for holidays and holiday home ownership. • Residential Internet holiday bookings rising steeply benefiting the “Buy to let” market. 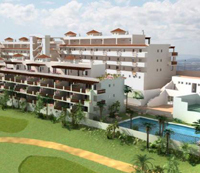 Valle Romano Golf & Resort is located just outside Estepona, on the South Cost of Spain. It is easily accessible from major road networks and 3 major airports (Gibraltar – 20mins, Malaga – 40mins and Jerez, 1 hour). The area is developing fast with a number of golf and commercial developments due to complete within the next 12 months. Prices reflect the developing nature of the area and whilst it is just 20 minutes drive from Marbella and Puerto Banus, apartments here are 60-80% more expensive. The Village at Valle Romano has been conceived with the aim of being Europe’s number one golf, fitness, and leisure resort. Think “La Manga”, only in a better location and with nicer weather! It has an extensive list of features and amenities. 12. Onsite 5 Star hotel with 120 rooms. Have room service in your apartment! 13. Private Beach Club and free shuttle bus. If you would like to know more about The Village at Valle Romano please fill in the form below, to receive our investment pack.